New York Looks To Bring Bitcoin Out Of The Shadows : All Tech Considered Bitcoin has been tied to the dark side of the Internet, where it's been linked to drug trafficking. But New York's financial regulators say they want to foster innovation and are looking to legitimize the virtual currency by licensing it. Cameron (left) and Tyler Winklevoss testified Wednesday at a hearing about virtual currencies held by the New York Department of Financial Services. New York could soon become the first state in the nation to write comprehensive regulations for the largely lawless world of virtual currencies. The biggest one, Bitcoin, has many boosters, but it has also been connected with some spectacular crimes. On Monday, federal prosecutors announced the arrests of two men accused of using Bitcoin to help their clients buy and sell over $1 million in illegal drugs. Richard Zabel, deputy U.S. Attorney in New York, says Bitcoin is fueling a new wave of crime. Not long ago, arms dealers and drug traffickers preferred payment in cash, but moving briefcases full of bills is risky. "By contrast, large amounts of bitcoins can be transferred anonymously and safely to someone located anywhere in the world with just the click of a computer key," Zabel said. 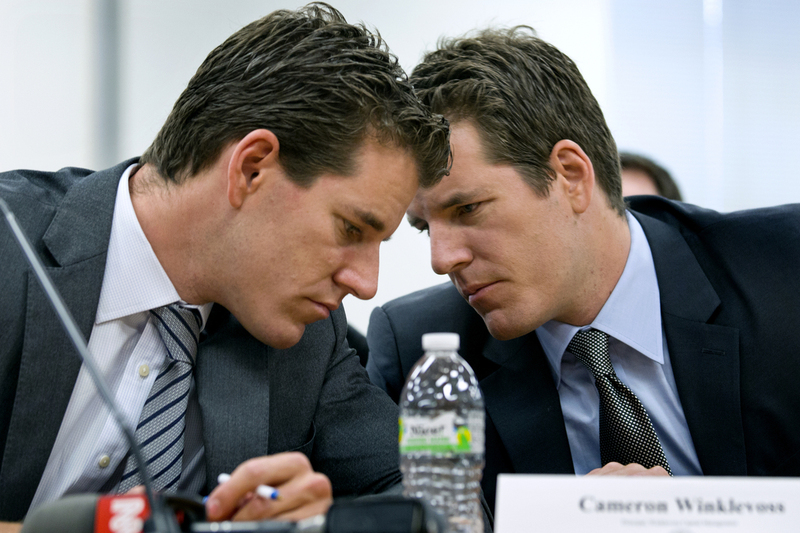 He spoke in lower Manhattan, at a two-day hearing that also included the Winklevoss twins. You might know them from the movie The Social Network. Years after suing Facebook's founder, they became big Bitcoin investors. "Bitcoins — it's freedom," Tyler Winklevoss said. "It's very American." It's also sort of hard to get a grip on: You can't put a bitcoin between your teeth, or fold a bit bill into origami. Unlike regular money, it has no physical form; it's computer code. Over the last year, the value of a single bitcoin has fluctuated wildly from as little as $13 to over $1,000. Speculators and criminals seem to like virtual currencies, but at least a few mainstream businesses are interested too. On Jan. 9, the online retailer Overstock started accepting Bitcoin as a form of payment. Since then, customers have used Bitcoin to buy about $600,000 worth of goods. It's a small sum for a big retailer, but Overstock.com Executive Vice Chairman Jonathan Johnson said there's a lot to like about Bitcoin. Credit card payments usually take a few days; with Bitcoin, Overstock gets paid right away. Even better, there's no middleman — like a credit card company — taking a cut, Johnson said. Not long ago, Johnson was back home in Utah, getting a haircut, and mentioned this fact to his barber. He says she was impressed. "And she said I would love to have something that didn't have [an] interchange fee, where I wasn't giving 3 percent of every haircut to the credit card companies," Johnson said. "So I think both large and small businesses have a real incentive." The hearing room in Manhattan was filled with guys in suits: mainly younger, a lot of financial types. But Bitcoin supporters, like James Barcia of Bitcoin Center NYC, want to broaden its appeal. "We are about 100 feet from the New York Stock Exchange," Barcia says. "We're the city's only brick-and-mortar organization dedicated to basically evangelism in favor of Bitcoin and its peers — other electronic currencies." You can take a class here, called Bitcoin 101, or buy a T-shirt with the Bitcoin logo — it has the double bars of the dollar sign, but with a B instead of an S. As Barcia spoke to me at the center, about a dozen people were watching a live stream of the hearing, projected onto a wall. People here say they welcome regulation, but not too much, please. Ben Lawsky, the New York State Superintendent of Financial Services, basically the state's top financial regulator, said he wants to bring Bitcoin commerce out of the shadows by issuing a bit license. "Our hope is to do something in 2014," Lawsky said. "I mean frankly, if we want innovation to happen, and we also want to root out money laundering, and we try to get that balance right, we also want to give businesses certainty." If New York gets the balance right, Lawsky says, it could become a center for legitimate Bitcoin commerce.